The “Bike Path”, as it is locally called, runs 26 miles from Charlevoix to Harbor Springs in Charlevoix and Emmet Counties. The trail is mostly dedicated and paved in asphalt. It is currently the best developed and most suburban of our trunk line trails. 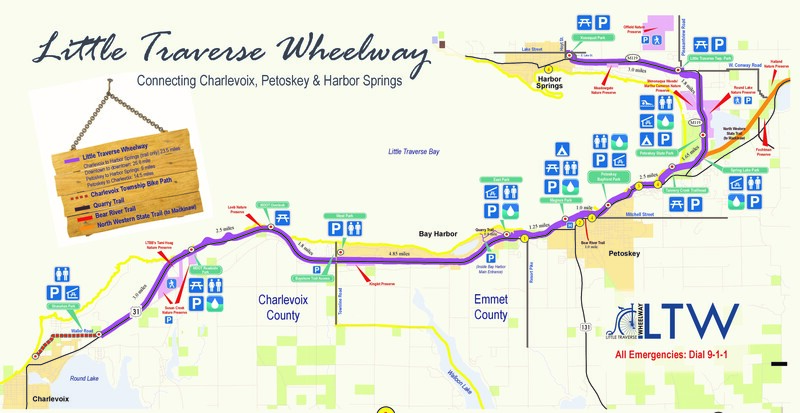 The part between Petoskey’s Bayfront Park to Petoskey State Park follows closely the path of the original Little Traverse Wheelway that stretched from Petoskey to Harbor Springs in the 1880s and ‘90s. A gate over the trail at the east end of Bayfront Park proclaims “No Teaming or Driving,” and replicates the original gate that stood at nearly the same spot. This gate is a reminder of a time when people were prohibited from riding horses or horse-drawn carriages on the trail. Two other identical gates have been built to the west on Petoskey’s portion of the trail. The trailhead is located at the Charlevoix Township Hall 0.50 miles from US 31 on Waller Road where parking and restrooms are available. Trail users can go into the city by following Waller Road west and McSauba Road east to Division Road. This in-town trail passes close to the North Point and Mount McSauba Recreation Areas. Another marked bicycle route leads cyclists from the city of Charlevoix to Waller Road, utilizing a safer route through town (starting on E Dixon Ave) for traveling in that direction. 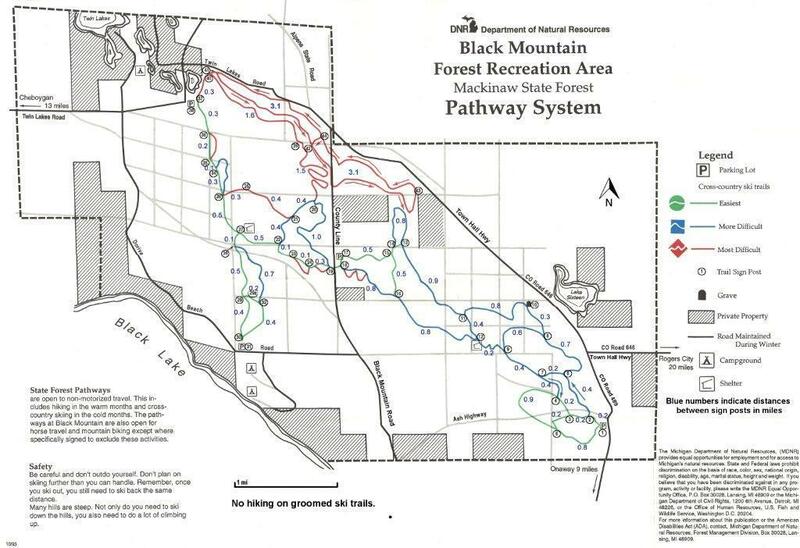 The “dedicated” and measured portion of the trail begins at US 31 and includes 3 miles of asphalt and .6 miles of boardwalk through a wetland. The trail closely follows US 31 and Lake Michigan much of the way and there are many good lake views. The rest area on the trail side of US 31 is a delightful place to relax and view the bay in all its glory. There are plenty of picnic tables available to eat your lunch or just enjoy the view. Pit toilets are available. To the east, the area around Nine Mile Point (MDOT overlook) is especially scenic and there are other good places to enjoy the view. Enjoy access to the lake at Loeb Nature Preserve. West Park’s parking and restrooms are located several hundred yards north of the trail on Townline Road but there is a de facto trailhead right on the trail. This segment consists of five miles of asphalt near US 31. There are some panoramic views of Lake Michigan and the business district called The Village at Bay Harbor is a short ride from the trail. There are good parking and recreational opportunities at both Bay Harbor parks (East and West) as well as in the Village District with its many amenities. East Park is an excellent intermediate trailhead. The park is one of the most beautiful parks of its kind in the country, with glorious views of the bay. Restrooms, parking, a picnic pavilion and a playground are available on a seasonal basis. This segment was relocated from the highway shoulder and paved with asphalt in the summer and fall of 2008. This segment runs 10-50 feet or more above the bay and is widely regarded as the most scenic on the entire Wheelway and surely one of the most beautiful in the country. There are numerous turnouts with benches where trail users can stop and enjoy the view. This segment proceeds from Magnus Park, a city campground with lake access. The W Lake Street portion was reworked in 2018 to create a 10-foot path on the north side of the street. 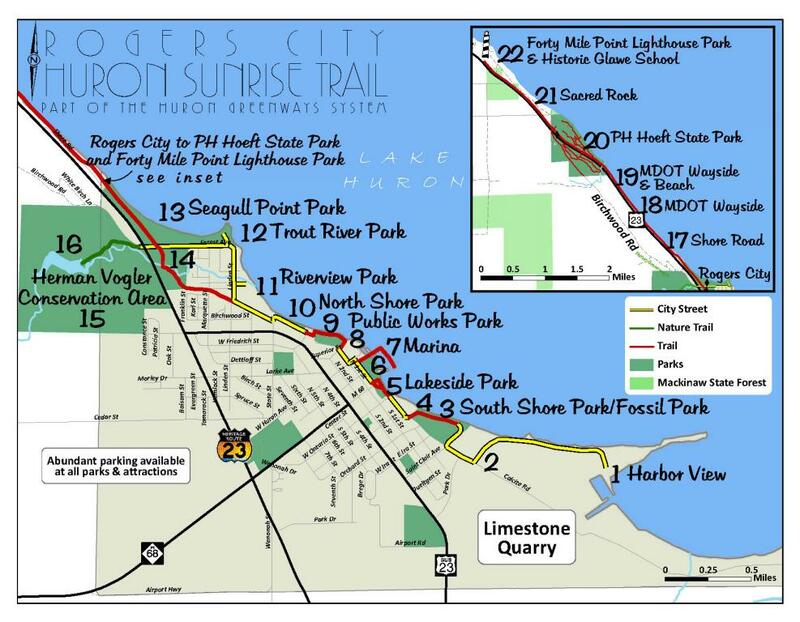 The trail turns off Lake Street to follow a dedicated trail through a section of city parkland and finally across the Bear River to the Petoskey Marina and Bayfront Park. This section has also seen the erection of two more Little Traverse Wheelway arches (“No Teaming or Driving”, referring to the ban on equestrian use of the trail in the 1890s). Another arch can be found further east along the Wheelway. Also check out the metal sculpture of a big wheel bicycle in the new park. The History Museum has wonderful exhibits depicting Petoskey’s place in history. This scenic segment runs through Bayfront Park and through Bay View. The History Museum is a must stop for those interested in the history of the Little Traverse region including the role played by the original Little Traverse Wheelway. The bicycle arrived here along with the railroad and the new wave of settlers who came for economic and religious reasons. 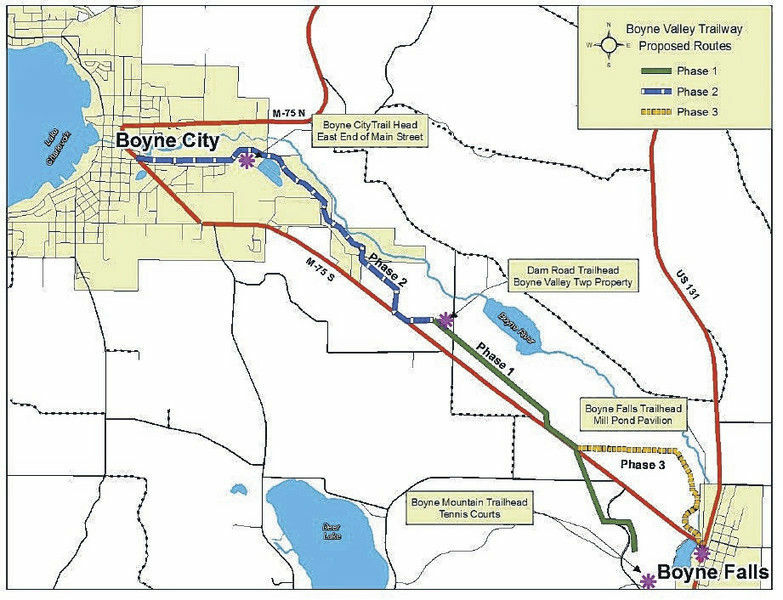 Farther along in this segment are located the Petoskey Marina, the Midway, the Bayfront Resource Center, the Ed White Softball Field, Yosemite Falls, Lime Kiln Pond; as well as restrooms and numerous picnic tables. Parking is available in Bayfront Park and there is safe access to Petoskey’s historic Gaslight District (downtown) through the tunnel under US 31. This segment also goes through the summer community of Bay View along the salmon-colored sidewalk. Stop and enjoy the ambiance of Petoskey’s “summer sister” that grew up along with the city in the 19th and early 20th centuries. The gazebo overlooking the bay behind the D&W shopping center honors the memory of Fred Fettis and Neal McCue, two longtime trails advocates who were instrumental in the development of the Wheelway and served on the TOMTC board of directors. TOMTC is working on a plan to improve the parking lot and grounds in this area and perhaps establish an intermediate trailhead. There may also be a park at the nearby mouth of Tannery Creek in the future. The overlook is a good place to stop and view the bay and is a popular picnic lunch spot for people working in the area. Opposite the overlook on the rear of D&W Fresh Market is a beautiful mural by Kingsley muralist Terry Dickenson depicting transportation along the Wheelway corridor at various times in history. TOMTC commissioned the artist to paint the mural in the fall of 2006. The trail continues past the Tannery Creek Trailhead through private property (Tannery Creek condominiums). A chain-link fence on the north side of the trail marks the boundary of the Petoskey State Park. Here a wood-chip trail leads to the Tannery Creek Campground of the State Park. The Wheelway continues through a wooded scenic segment that runs through a young oak and white pine forest to M-119. Immediately on the left is the Packy Offield Trail Center, which became the headquarters of Top of Michigan Trails Council in 2016. The property was purchased through the generous donations of TOMTC supporters and a number of organizations, including the Petoskey Rotary. A fountain and bench in front of the Trail Center are a generous gift to trail users from the Litzenberger family. The Trail Center is open 9 – 4:30 on weekdays, and offers trail users a variety of maps and great advice on outdoor adventures in the area. A port-a-john is available for trail users during the summer and fall months. Parking, restrooms and a bike fix-it station are available at Spring Lake Park across M-119 from the Trail Center (public parking is not available at the Trail Center). A crosswalk just north of the Trail Center connects riders with the NWST. This segment tracks along a largely commercial area along M-119 and past the main entrance to Petoskey State Park (which offers restrooms and beach access) and past Beach Road. This segment runs close to M-119 before cutting away to follow the northeast edge of the Harbor Springs Airport. Enjoy the panoramic view of Little Traverse Bay at the Little Traverse Township Park where parking is available. This segment is accessed by crossing M-119 at the traffic light at Pleasantview Road (across from the township park). The trail then follows the highway, sometimes just off the paved shoulder, and sometimes off-road. The Harbor Springs trailhead is near the ball fields at Lake and Hoyt on the east side of town, where restrooms and parking are available. 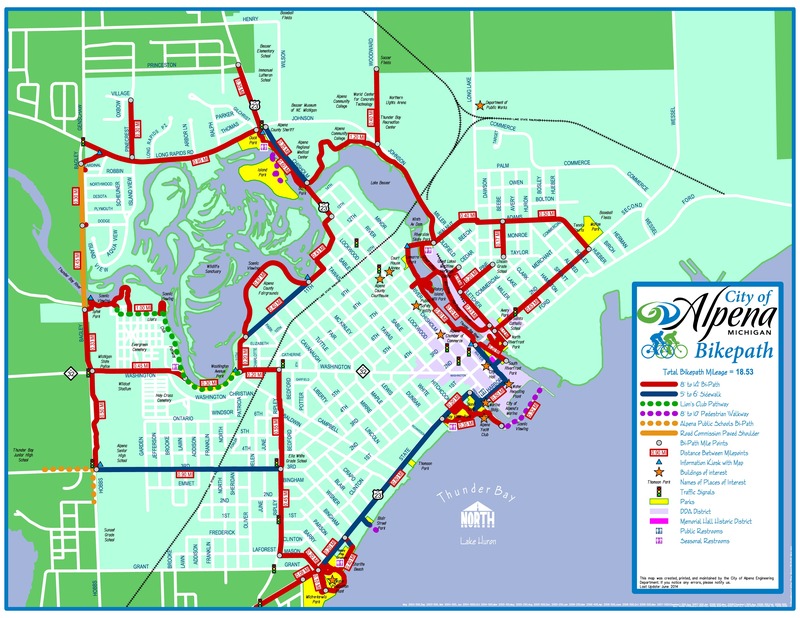 Local streets can be used to ride into Harbor Springs, a wonderful destination with beautiful views, excellent restaurants, and a multitude of things to do. About one mile north of the State Park entrance, Beach Road provides an alternate route to Harbor Springs. Turn west and stay to the left all the way to Harbor Springs, passing through the Ramona Park, Roaring Brook, and Wequetonsing associations. (View map of the route HERE). This route can have a great deal of automobile traffic during the tourist season but should be generally safe for adult cyclists. Be especially careful in riding on the twisting portions through the forest. Riders should ride single file on the far right side of the road.